Water is a critical resource we all share, it’s vital that it is well managed to ensure the sustainability of our water supply and our watershed. In Peace River we draw our water directly from the river, it’s processed in the treatment plant located in Shaftesbury estates. From there it is pumped into homes and businesses across Peace River. When it has been used and goes through the drain it ends up in our waste water treatment plant, located on the furthest north portion of the town. There the water is once again treated before being released back into the Peace River. 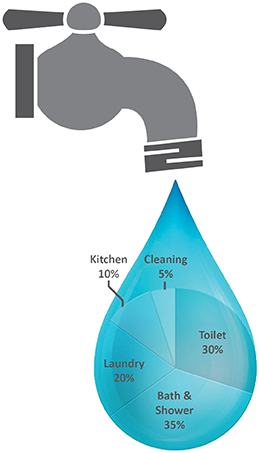 This graph shows how the typical Canadian household uses water. The data comes from Environment Canada. Did you know the average shower head has a flow of 9.5 litres a minute? It could fill up pickup truck gas tank in about 15 minutes, it’s a lot of water. One excellent way to save huge amounts of water is to replace your fixtures – shower head and faucets with low-flow versions (don’t forget the toilet!). These options save on average 40 percent and can even save more depending on what you get. Speak to your local hardware store about what options they have available, pricing and selection may vary. Another thing to consider are rain barrels. The Mighty Peace Watershed Alliance, of which the Town is a member, is currently able to help residents purchase affordable rain barrels for their homes. This can help keep your lawn and garden growing while lessening your dependence on municipal water for those purposes. Nothing will run up a water bill faster than a leaky pipe. Often times homeowners aren’t even aware the pipe is leaking until the see the consumption reports or their bill. If you think there might be a leak, try flushing some food colouring, then check to see is coloured water is leaking from any of your pipes. If this doesn’t show where the leak is, but pipes are leaking yo should contact a plumber to help isolate and correct a leak. Leaks and dripping faucets are small problems that end up costing money. For example a study by the US Environmental Protection Agency found the average drip from a faucet could add up to 946 litres in a month – that’s almost a cubic metre of water just dripping down the drain. The easiest thing to fix is our own habits. Take a look at how you use water, small changes in behavior such as, taking shorter showers, turning the tap on and off while shaving, doing dishes or other chores will dramatically reduce your consumption. Ensuring you only do laundry with a full load, taking shorter showers, ensuring taps are securely turned off etc. More great tips are available in this article from Canadian Living Magazine on how to conserve water in your home!